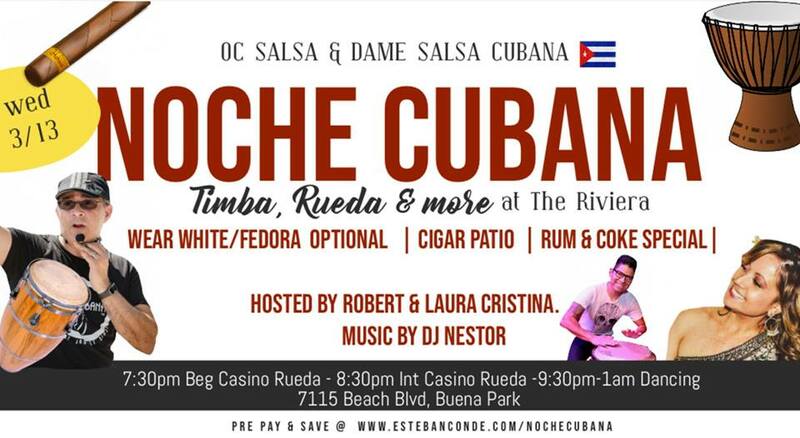 8:30pm Intermediate Casino Rueda by Robert and Christina from Dame Salsa Cubana! Description: Wear white and fedoras optional night, but encouraged. Big patio, you can smoke your cigars (you must bring your own, we won't be selling there). Dj will be playing a mix of timba then alternating with bachata, merengue, and salsa, then back to timba (Cuban salsa as well). Lots of folks to dance Cuban salsa and casino rueda with!!! Beginner Casino Rueda is for intermediate Salsa on-1 students. Basic won't be covered at this class. No Intermediate Bachata Class That night.